Registered with an account on the site and it doesn't allow to log into the app. Very buggy and won’t even let me log into my game informer subscription account to view the magazines. Trash app. Love the idea, wish I could say the same for the app. I love the idea, I can take away and not have to remember to grab the physical copy. This has a lot of bugs that are annoying more than anything, the app randomly flips the page back after just touching the screen to scroll. Pages also turn with no input from touch screen. I have had this app for almost a year and yet this known issue is still not being corrected. I ask the the editor try to read an issue on the app ( iPhone X) and tell men then he is happy with the app. Over all I love Game Informer just not the app. Can’t log into my account. Keeps saying information not authorized on our system?! I can’t log in with any username or password. This app is worthless. Won’t let me use my subscription I got at Game Stop. I just logged in on my laptop and when I try to on the app it says my username and password aren’t in the system. Very aggravating when I just want to read the new issue on the go. Horrible app. You can't purchase anything! I can sign into the gameinformer website just fine but when I try to sign into this app it tells me I’m not authorized. This is such a joke. I love the magazine but this app is terrible, I can log in to the website and read my issues there but when I try using the app I can’t even log in, it says my account doesn’t exist even though it clearly does. I’m subscribed and opted for the application. It took way too long to download the issues and when I try to open it crashes! So I have a subscription and can’t read none of the issues. 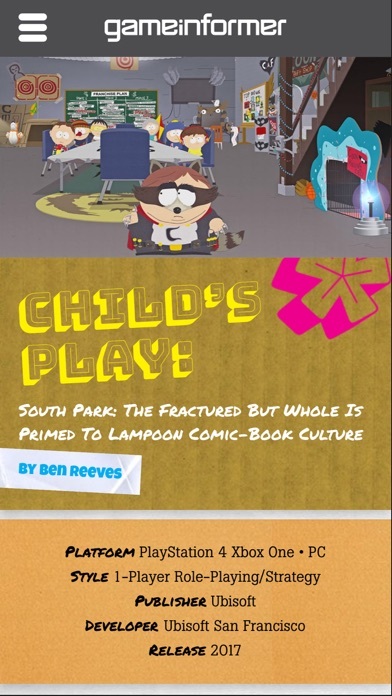 For a gaming and technology magazine their app is garbage. I found it to be virtually impossible to connect my subscription to my online account. Then I was unable to connect that online account to the app. 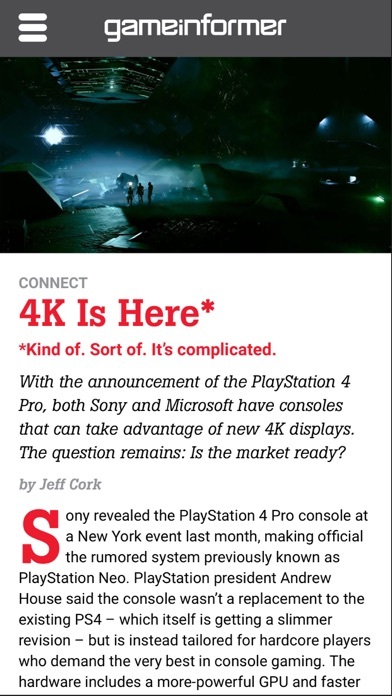 Pretty disappointing coming from a gaming magazine that I really do enjoy reading. I never make it more than 2 pages into any issue and the app crashes. It’s been like this for months. This app has a lot of potential. When it works, it works well. However, there are several issues under my subscription that force the app to close without any error messages. It doesn’t matter if I remove it and find missing issues. Either way, certain issues cause a crash. If this can be fixed I would gladly give it a 5 Star. In its current state, it is too frustrating. Lags out every time i try to read a magazine!!! Almost completely unresponsive or will crash after a long delay. This app is worthless as it is. I am unable to read my paid for subscriptions. Newest revision fixed a glaring issue with the UI. It’s a great mag with nice exclusives and good articles that make for fine think pieces on gaming and its industry. The awesome covers make me long for the days when I received physical copies, but I appreciate how I have all my issues at my fingertips (or with an easy download). Please fix where the pages keep turning back. I’m reading or scrolling and it automatically flips to the previous page. I love GI. Please fix and I’ll give it 5 stars. Just got the new version. Still crashes as soon as you hit “read” on an iPhone X. I will not be renewing my subscription. I overcame login issues, but app is buggy. Update 12/7/18: I’ve had an issue where the app starts to open, then closes. The only way to overcome it seems to be doing an uninstall/install after which it’ll work for a day. This makes the overall experience very frustrating. Like so many, I too had an issue logging into the app. I emailed customer service outside of business hours and received a reply 6 hours later. I was told to use only my zip code and email address to link my account. Once that was done, I was able to login to the app. I deleted one star because the app still has some bugs which required me to reinstall. Downloading the app takes forever like 10 to 20 minutes or more and if u multitask while it downloads it stops n u gotta start all over again. Get the paper backs. I went to GameStop and i always turn down the pro membership. I know I was going to be purchasing the Switch and Xbox One X this year, so I joined to earn points. I was also interested in the game informer magazine. So, I downloaded the app in attempts to view the magazine. It NEVER happened. I was never able to link my subscription! I called the help line and they reset my account and it still didn't work. Also, the help line takes $20 minutes to get in touch with a rep. Don't waste your money! Its trash. I can't find out how to get back to he main library without closing and reopening the app a thousand times. It's frustrating. I’ve reset my password several times, still can’t log in. And yes of course I’ve tried email address, user name and display name, none of them work. I click download and it just stays at 0% forever. I have force closed, restarted, reinstalled app and ofc made sure my subscription is current. Very frustrating. With this app you can buy their magazines.This is not free. Every time I try to log in it says my info is wrong and I even go as far as changing my password and it still says it’s not correct. I’ve had nothing but trouble getting my magazine that I paid for. I love the game informer magazine but the app has been a constant problem. The app barely works and it’s difficult to download my monthly magazines. Recently went through all of the steps to re-link my account to the app, only for it to give me an error message. Please fix. If I would have known it would be this difficult I would have kept getting my physical copies in the mail. I love the idea of the app but there are way too many bugs for me to remotely enjoy using it. A lot of reviews say they can't back out of a issue, which I've never had any problems with (just press and hold on the middle of a page and it will give you the option to back out), but I've had major problems with things as simple as turning pages. I will turn the page and it will get stuck half way and it won't let me continue turning or reading. I have to turn back a page and go forward again about 4/5 times before it skips the page I want to goto and then I can back into the page in order to read it. Also the purchase and other links at the problem are generally buggy. It won't actually launch the site but instead, it will just sit there and act like I never pressed it. Also the biggest issue I have is that I can't load some issues that are in my library. I have a subscription, and yet it won't let me read the issue unless I spend $5 to buy it individually. I am currently having that issue with my monster hunter world December 2017 issue. If you have the choice to get the physical copy, do that instead. The app has been broken forever and a day and no one's doing anything to fix issues that have been around since the app launched. Works great on the iPhone even though issues take forever to Download. However I find it useless on the iPad. Who buys a iPad to read a magazine in landscape rotation? Every other magazine on earth is in portrait. You can’t even log into the app anymore and they just redirect you to view the issue on their website. What is the point of the app if it indicates logging in availability is currently down then directs you to the browser site. Making me really regret not going with the physical issues of the magazine. At this point a refund should be in order for anyone who purchased the membership and opted for digital copy. It’s been broken for months with no ability to log in! I can’t even log in to the app or browser version to read the magazine. What’s going on here? This magazine offers a good product. Never opt for digital. Some how, the biggest magazine in the US can’t figure out digital and certainly can’t figure out usernames and passwords. If you download, I hope you have fun trying to figure out how to log in. Subscription cancelled and I will now buy games from Amazon and not Gamestop. You just lost a very very good customer. If I can’t read the magazine on my phone anymore I will cancel my subscription and stop purchasing from GameStop through my Pro Account... Target has the same games... and in better stock. The app and no longer allows me to login And all of my downloaded issues have disappeared. Did they design it to be bad? I tend to read things on my phone in landscape, and the app doesn't support landscape. Your forced to read it in portrait. I might be in the minority but this is a deal breaker. Aside from all the bugs everyone and their grandma is reporting. Game informer just does not care. I’ve been trying to log into my account and it says it is not linked. I can login online with no problem, but not on the app. Kind of useless. App crashes trying to delete old issues. Have to call support every year when I renew because this app can’t recognize I’m still a subscriber. 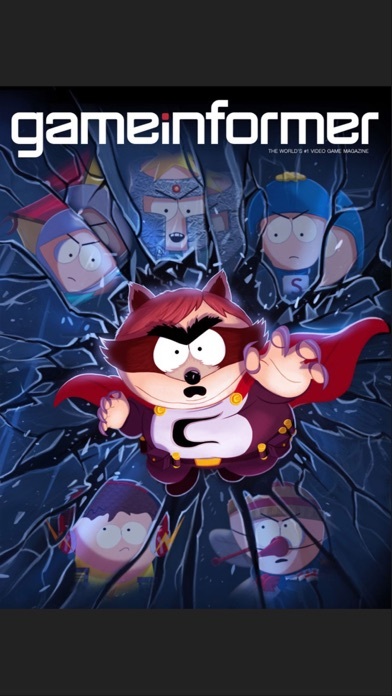 GameStop/GameInformer should be embarrassed to have their name associated with this program. Haven’t been able to link my subscription or read an issue without paying for the issue again in over a year! The worst part is that the company just doesn’t care. No one has bothered to update this app since it launched. I don’t understand why this app is rated so poorly. The only thing I can think of is that Gameinformer is receiving a lot of misdirected Gamestop hate. I am running this app on the newest version of iOS on an iPad Pro 9.7 inch and the digital magazine is beautiful. 99% of the complaints users have about Navigation is resolved if you read the User Interface Demo that pops up after opening the app for the first time. To address one complaint I’m seeing pop up in a lot of reviews: to back out of an issue and access the main menu again, tap and lightly hold the screen and the User Interface will pop up. The demo is also available for access at any time in the “help” tab in case if you forget the gesture controls. I have had absolutely no issues running this app. Magazines download fine, pages turn beautifully, the scroll feature works great, imbedded videos and their sound play seamlessly. There have been zero crashes with my use over the past year since switching to digital. As far as the content of the magazines — no, these are not PDF copies of the print magazines. All of the text is there, but the arrangement is catered to being on a digital device and digital users actually get MORE than people receiving print magazines. 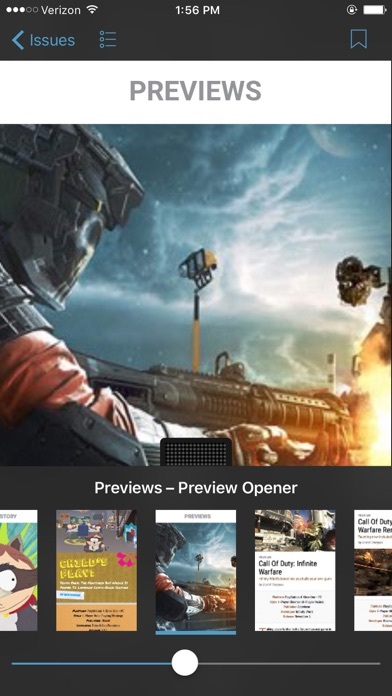 For each game or event mentioned, you get direct links to view additional previews, reviews, and features on the Gameinformer website. You even get direct links to purchase games from game-stop—should you choose to purchase games from there. Imbedded videos are wonderful. When I see a new game that I’m interested in, a lot of times Gameinformer will have a trailer right there on the page for me to watch at that exact moment. My experience with this app has been incredibly user friendly. Images, videos, and sound are beautiful on my iPad and I don’t regret switching my subscription to digital. Also, I really enjoy the high quality editorial presentation of the features. The writing is adept and packed with information. We live in a world where we get news every second of every day, so monthly magazines are struggling to compete. 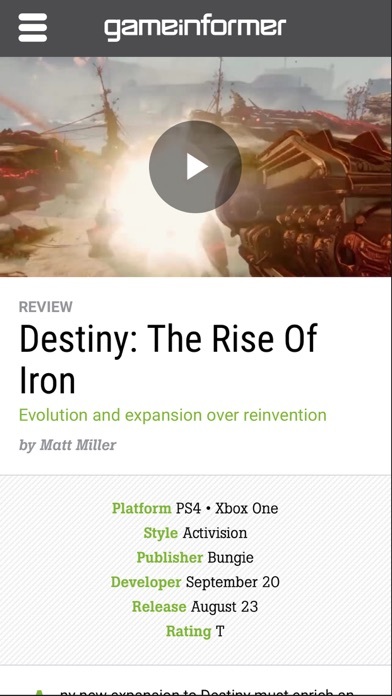 Gameinformer is succeeding in maintaining relevance through this app. I can’t use my login information to read my magazine subscription that I paid for! It works via their website, but upon using the same login information on the app, I’m met with: “invalid username/password”! Have emailed customer service multiple times; they’re less than helpful, and take days to respond! This app - even after all this time - is the absolute worst. And the site for the magazine is archaic and backhanded. You need your username to login but if you don't remember it you need to...call? Are you *^%}} serious? Link your subscription - digital - but the tool fails? How about learn how to write a site with modern recovery methods and 2FA. Do you have a bunch of juniors writing this stuff? Call me, I'll give you my billable rate to make a site worth your subscribers' time.